Other than the tourists, Near Sawrey's a fairly typical Cumbrian village. A cluster of cottages at a junction of roads surrounded by fields, easier to walk round than to drive, on the slopes between high woods and lakes. The western half of the village looks down towards Esthwaite Water, while the east is on higher ground where sheep safely graze. Back in Beatrix's day the place supported two shops, a pub, a smithy, a carpenter, a timber merchant and a post office, whereas today only the pub survives, along with a hotel and various cottages that do cream teas. 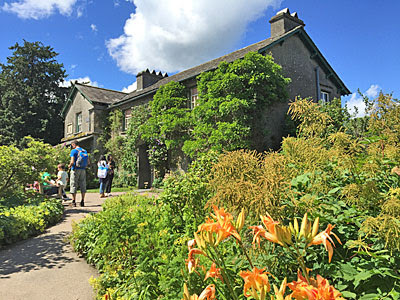 Expect to see several tourists wandering around taking pictures, especially of cottages immortalised in some of Beatrix's illustrations, which a National Trust map helps to identify. One B&B has placed a straw Mr McGregor on a bench out front, offering a photo opportunity in return for a charitable donation, while the pub revels in attracting passing trade because there isn't actually much more in the village to see. Hill Top is still a working farm, but visitors don't get to see much of that, with access restricted to the house and garden, plus a small shop shoehorned in by the front gate. You'll need to have paid back in the car park, which is a little annoying if you haven't come by car, and might mean a gaggle of Japanese tourists have taken their timed ticket before you. I had an hour to wait before I could enter the farm cottage, but that left the gardens to look round, and they're beautifully maintained. Unfortunately they're also quite small, not by farmhouse standards, but in terms of visitor attraction capacity. The main garden follows a long path up from the shop to the house, its borders bursting with summer colour, but not the easiest place to stand and admire when others are trying to walk up after you. Then there's the vegetable patch, a stepped square surrounded by hedges, with Mr McGregor's tools planted artfully in the earth. Everybody wants their photo taken here, with the cottage in the background, but you have to take your turn and it takes a miracle not to end up with a mass of milling visitors inbetween. Oh, but that's it for outside. A long garden and a square garden, plus not that many benches to sit on, means there's not that much to see while you wait to get inside. A lot of people end up gathering outside Hill Top's front door waiting for their scheduled visit, making an unobscured photo almost an impossibility, or heading back down to the shop to peruse the merchandise again. Potter's books are among the cheaper souvenirs, while anything with the rabbit on seems to sell well overseas. A few Middle Eastern tourists looked distinctly nonplussed by the wait, hanging around in the layby across the lane, unwilling to stroll off and explore elsewhere. I used my spare half hour to write some postcards, affixed with Peter Rabbit stamps I'd bought with me. 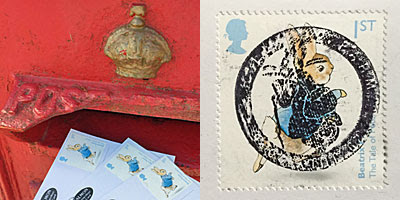 The Royal Mail have issued a special 150th anniversary set, and have promised that any letter posted this week in Near Sawrey's postbox will get a special Peter Rabbit postmark. I'm glad they told me what it was in advance, because my postcard arrived home the following day irredeemably smudged, and the rest of my family regretfully report the same. When at last the time comes to enter the house, rest assured it won't be overcrowded inside. Numbers are carefully controlled to allow you to wander around freely and unguided, to enjoy the cottage interior that Beatrix used as a place of inspiration. Almost all of it is original, from the furniture to the knick-knacks, because transfer to the National Trust was made directly after Potter's death in 1943. In a rather nice touch children are offered a copy of The Tale of Samuel Whiskers to take round, with certain pages marked, as a treasure hunt to find the actual dresser, fireplace or bedstead depicted in the illustrations. It's evocative, and somewhat dark, but with only two rooms accessible on the ground floor not especially large. Upstairs there are four more rooms to see, with contents including the doll's house from The Tale of Two Bad Mice and a selection of her brother's paintings, plus a sign reading 'Please Mind The Step' in Japanese. 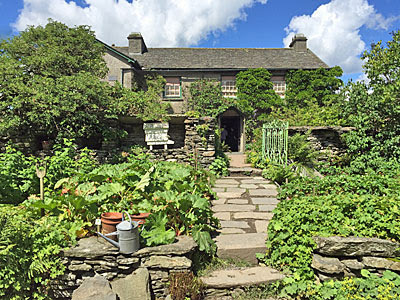 A visit to Hill Top opens an illuminating window into the author's life, although perhaps isn't great value for the admission price, especially if you've come halfway round the world to enjoy.